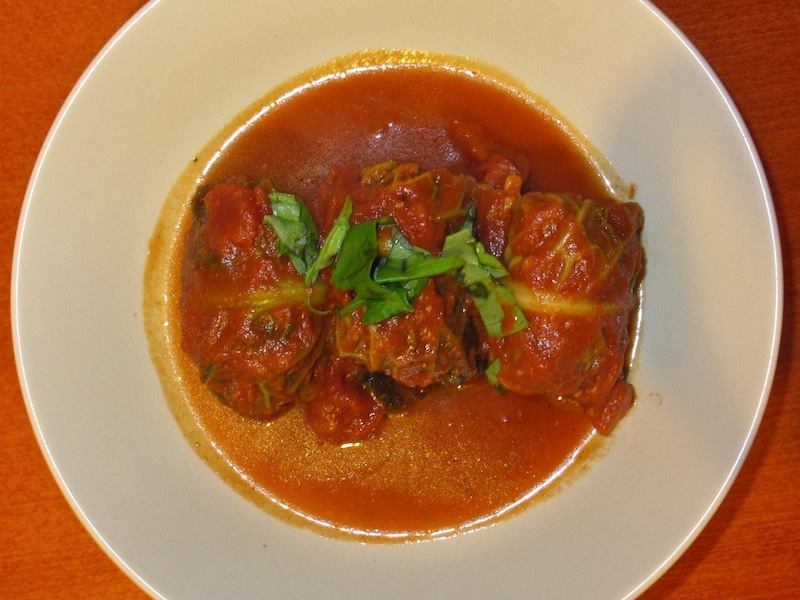 While making these stuffed cabbage rolls, I cannot help but think that they are actually makeover of meatballs. Many recipes are derived from a specific recipe that each and everyone of us have interpreted. 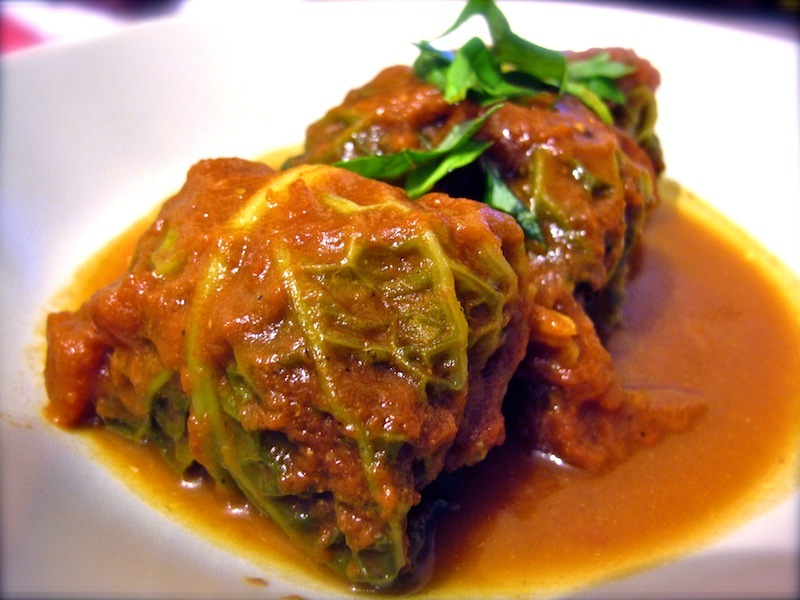 So these aren't gołąbki, the Polish traditional cabbage rolls but they are my adaptation and interpretation. Let the meatball makeover begin!! You must be wandering why I think this is a meatball makeover. First, the filling is similar or can be the same as typical meatballs depending on how you like them. Now, they are wrapped in a blanket of cabbage. It is like putting on a dress with beautiful pattern. Stuffed cabbage placed carefully in the pot. The sauce should be thicker than this. This was boiled for about 30 minutes instead of the required time as I was too hungry to let it simmer. So please let it simmer longer or to the consistency you like. However thin this sauce is, it still tasted lovely. 1. Core the cabbage, peel off each leaf carefully and place them in a pot. Pour boiled water into the pot to cover over the cabbage. 2. Boil until the leaves are soft. Carefully remove the leaves from the pot and place them on a plate to cool. 3. 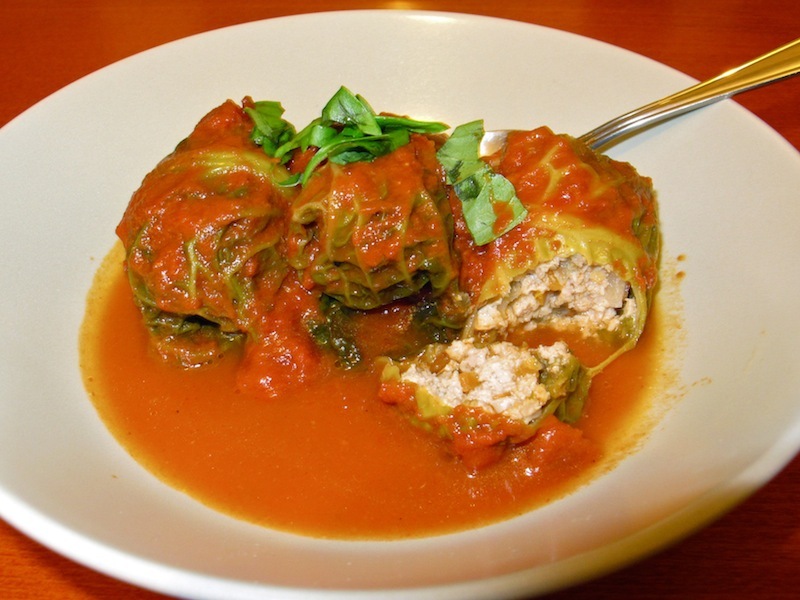 While the cabbage leaves are cooling, mix well the filling ingredients with your hands with kneading motion. 4. Mix the sauce ingredients in a different bowl. 5. Now roll the mixed filling into batons, not too big making sure it is about 1/3 the width of the cabbage leave. 6. Place a cabbage leave on your worktop and fill it with the rolled fillings. 7. 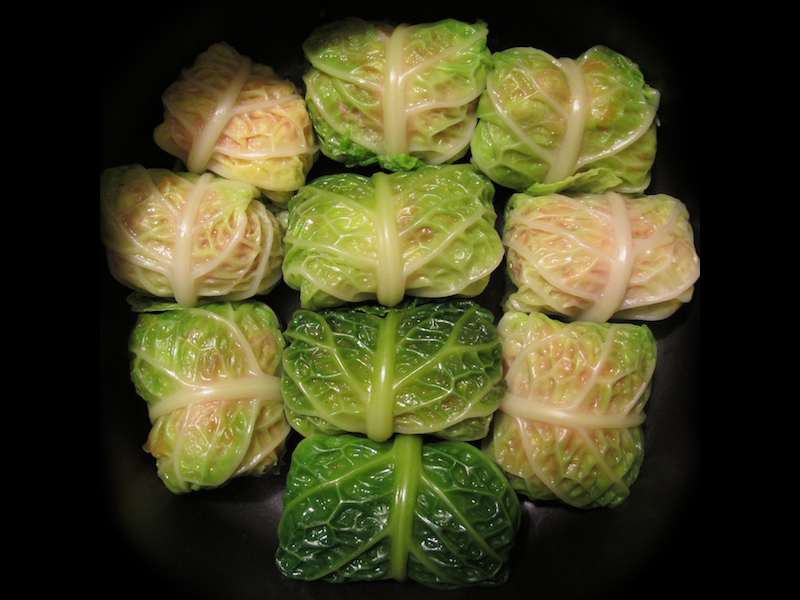 Then fold in the sides of the cabbage and start rolling from the base of cabbage first. 8. Place the rolls in an empty pot and pour the over the sauce mixture. 9. Bring the pot to boil and simmer for about an hour to thicken the sauce and let it sit for 20 to 30 minutes. 10. While the pot is simmering, gently lift the rolls to make sure they don't burn. 11. When ready, carefully arrange the rolls on a plate or a wide bowl. Then scoop some sauce onto the rolls. Garnish with parsley or basil leaves and serve.